Too bad this turned out to be a scam. More thorough checks need to be done on props such as these, the comment from ageless was a warning something was up. voting YES from nearby Australia. you have my support. Thank you for your proposal. Thank you for your vote and comment blockchaintech! We are very grateful for all of the positive comments and support. Starter kit idea is very interesting -- especially with the mobile phone elements to it. Voting yes to give this a try. Looking forward to seeing your published results. Thank you for your vote n00bkid. We are very excited for this proposal and all of the support everyone has given us. Voting yes. We need to spread the word in the Phillippines.. Best of luck. We really appreciate the support! Thank you Wixamlee. 1. University students in the Philippines are obliged to by Lanyards with card ID holders. This means that all university students that get the start pack will be walking adverts for DASH as you can see the DASH logo is prominent on these lanyards. 2. The other important point we need to consider is that promotions work very differently in different countries. It is important for us not to impose our own exceptions on a project like this e.g. I can defintely see how this would work in the Philippines but it would not work in the US. This is why it is so important that promotions are specifically tailored for each geographic area because the people have very different needs and motivations. The best people to design a campaign that works in the Philippines are the people living in the Philippines. 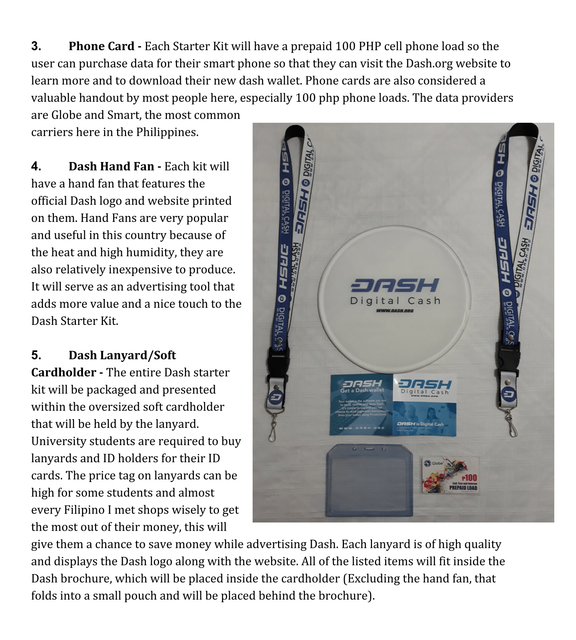 I can see how this promotion would be very popular in the Philippines and the merchandise is likely to cause a lot of buzz amongst students talking about DASH digital cash. 3. The Philippines in particular is potentially one of the best customers of DASH because millions of Filipinos leave their country to earn money oversees to send back home to family members. They often have to pay high transfers fees anything up to 10 to 20% of everything they earn can go in transfer fees to send money home. Imagine if people could start learning about DASH and how it can assist these remote workers send money to family members nearly instantly at less than a few cents. This could be huge for the Philippines. All they would then need is some DASH ATM points strategically places around the country and then all those millions of oversees workers would be able to securely send money home. In order to start DASH off in the Philippines however the people need to get some exposure to what DASH is. This promotion fits in perfectly with how to promote DASH in the Philippines. If this promotion was for US I would be doubtful but in the Philippines this definitely will work. The DASH branding will be perceived as "cool" just as other western brands are perceived as "cool" in the Philippines. The items are all useful for university students and it would be a talking point amongst all the university students. Having worked with some people in the Philippines previously I know they LOVE bonuses and any free items. The merchandise here combines a free give out with cool western branding so it will have double the impact. I really like this idea. MNO let's give this promotion our support. I have a very positive feeling about this project. It could be the start of something big for DASH in the Philippines and it very reasonably prices considering the number of university students it will benefit (2000 students) . I also like the fact that this promotion is very focused in one niche area of students. This again is exactly the right demographic for DASH. The more I look at this project the more I like this project. I am definitely voting YES on this one. Thank you so much DeepBlue for your support and taking the time to study this proposal further and understanding this exactly the way it was meant. 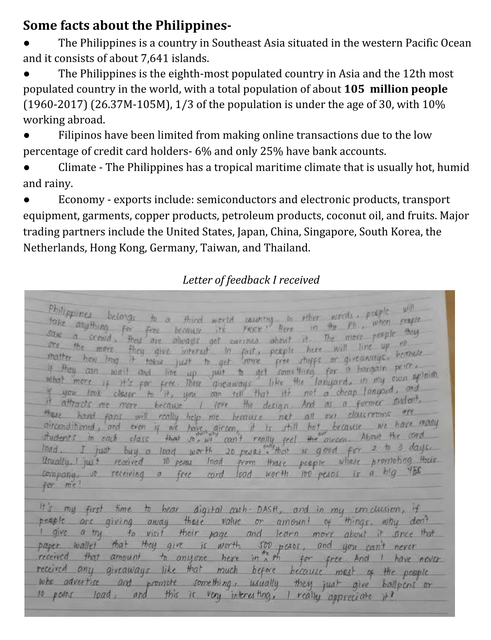 I put my heart into this proposal and my best effort to promote Dash here in the Philippines. MNO's will vote when they realise how well thought out your proposal is. It took me quite some time to see how clever this proposal was. MNO should consider this proposal not from the perspective if it would work in *their* country but if if would work in the *Philippines*. Western branding is perceived as very cool in the Philippines. I spoke to one of my employees from the Philippines about your proposal. She said this proposal would be very popular. She said that people in the Philippines even put stickers on their cars with Western brands like Apple and Microsoft etc. We would never do that in the West. This shows we need to evaluate a proposal from the perspective of the country it is going to and not from our perspective. This can be hard to do and it is not immediately obvious. DASH is very cool western branding and with it being Digital cash it's also relevant because the millions of Filipino workers oversees like maids who do not have a low cost way to make remittances back home. 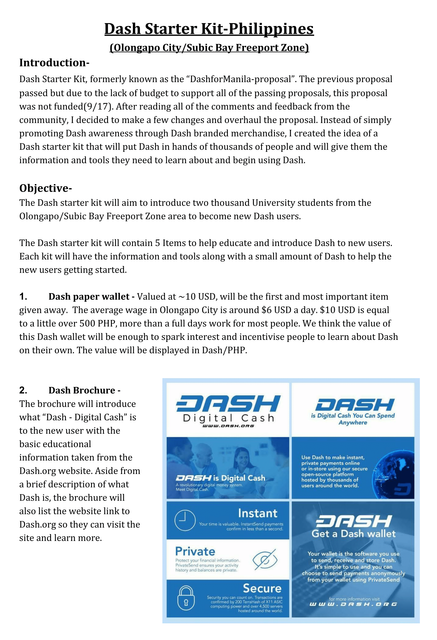 The university students you introduce to DASH would realise the power of DASH for making remittances home and could put together a guide on how to Send Money Home for those people working oversees. The Philippines is a perfect use case for DASH. This campaign would directly target the youth who are most open to technology and will see the benefits it could bring to your country. I hope the MNO's will take some time like I have to thoroughly study this proposal and think about it a little more before voting. What finally convinced me is when I asked other Filipinos about your proposal who knew nothing about it they all thought it was a very good idea. I have also learned something very valuable from this proposal. I've learned not to evaluate it only from my own perspective but to open my mind before jumping to a conclusion. Gather more information and then ask other people's opinion from that country so that I can see it from the perspective of the proposal owner's country. I will do this from now on for all proposals. So I have you to thank for this. This is a very clever, well thought out and perfectly aligned promotion. It is very targeted for the exact niche market and fits in perfectly with the culture in the Philippines. This is a very good opportunity for DASH to get started in the Philippines and I think this proposal could lead to big things there. Thank you Deep blue, we appreciate how much effort you have put into realizing our vision here. We have thought a lot as to what would really make a difference and what is also practical here in the Philippines. We realized that not only would people appreciate and brandish the promotional items like the lanyard and fans but also that a small amount of money would greatly incentivise the well abled students to educate themselves while leaving a grateful feeling towards Dash. We also anticipate the network effect or organic growth from the lucky recipients spreading news of their good fortune to their friends and family. We do believe there is huge potential for Dash if used here for remittances, as you pointed out. If we can have a good impression on the younger generation here, again as you stated, they will be able to aid their families in receiving and using Dash. If this is as successful as we hope, we will be putting together a campaign that will work towards educating and providing businesses with the knowledge and tools needed to natively accept Dash. More on this will be coming shortly. Again, we want to thank you for focusing on our proposal. Your comments were highly appreciated between our team. We understand that compared to other proposals, this may not seem as exciting on the surface, as you pointed out, but here in the Philippines would be a very exciting surprise for all who are introduced to Dash. Thanks again for bringing attention to us! I agree with DeepBlue. This is the right proposal for the Philippines and I know that the word of mouth news of this giveaway will spread like a wildfire. I appreciate your well thought out and crafted response in a time where I am seeing too many negative or poorly thought out responses to well done grass root proposals. Well done DeepBlue! It will be a shame if this proposal does not pass this time. This proposal is like night/day to the last one. Explanations are on the nose, why a lanyard is important and valued, or a fan etc... whereas before it seemed like silly swag. This is well organized, well thought out and simple. You have my vote. Thank you, TanteStefana! We really appreciate it. I like this version a lot better. Voting yes. The Philippines is an excellent location for DASH. The reason is that many Filipinos leave their country and work oversees e.g. as maid services in countries like Singapore, and Hong Kong. They often earn low wages. They also then need to make remittances back to their home country and often by high remittance fees to do so because they do not have a bank account in the country in which they are working. It would be very good if the team behind this proposal could think about how they address the remittance market for oversees workers like maids using DASH. It could save them a lot of time, money and their families can receive the money right away. I am voting yes on this proposal. I think the Philippines is an excellent destination for the uptake of DASH for all those people that left their home to work for their families oversees. Great point DeepBlue! I see huge potential with Dash in regards to remittances here in the Philippines. I have seen this in person when I visted Singapore and most of my Filipino friends have family that work oversees. Thanks qwizzie, we appreciate your support. Where are you based? I got one reply from you around the time of your previous proposal and then nothing after numerous attempts to contact you. I live in Manila and have been working on building a Dash business in the Philippines in my spare time. It's pretty difficult given the BSPs current stance. I've presented my Dash business to them to gain endorsement. I was trying to get into contact with you before then. My Initial feedback to MNO is this. It's all great airdropping Dash to Filipinos but the main problem is that there's no fiat Dash rails. At the moment the only way to really transact between the filipino peso and crypto is through coins.ph which doesn't list Dash. Its much better to do these airdrops when there's already infrastructure set up to support the fiat-Dash rails so that those that have been introduced to Dash already have an easy way to buy more. We want sustained interest. Criticism of this proposal: Why are you giving them 100 php worth of phone credit? If you've done your research you should know they can use piiko.com or https://en.bitrefill.com/philippines/ to top your phone up directly with Dash. Why aren't you educating about these services and using Dash to directly top their phones up? I use this all the time and its an amazing service. I would like to meet you directly and talk more about this proposal. It is well intentioned but we need a better plan to make a lasting impact in the Philippines imo. Hello, I am based a few hours north of Manila, and my partner is based in the US. I do recall your interest in our past proposal and I am excited to work with others on Dash related projects. Sorry for my late response I was discouraged after the prop passed but the budget was barely over and couldn't fund us, even partially, or refund our network fee. Maybe a meet-up could be started here in the Philippines? I will be monitoring my DM’s through Dash.org/forum if you wish to message me directly(peewee). We do recognize that there is limited Fiat-Dash rails and vise versa. Our target demographic here, however, would probably not make a large difference if they were all able to purchase Dash(lower income, college students). Our hopes are that the amount of Dash provided will be enough to financially incentivise them to learn about it with the other tools we will provide and little further direction, unless they are actively interested. We hope that they then talk about Dash and can share with their friends and families. We know there are services that allow you to purchase phone credits with Dash but we wanted to include the phone card so that we will have provided all the tools necessary for them to immediately be able to access the website and download the app. We will be sure to mention that Dash can be used to purchase additional phone plans/loads as well as point them to the merchant section of Dash.org. Yes, all for a Dash meetup. When you are ever in Manila next please reach out and we can try and meet up. my handle is "ageless" on the discord channel. If im not travelling, I'll be here. Ok, fair points. Sorry if I come across as harsh in my above points. Connect Core to Smart/Globe in some way. For example, everytime I land in the Philippines I always get a free sim. Something like giving away bits of Dash with the sim so you can top up could be a good project, etc. @12god, I'll be waiting to see your reply to @ageless before I comment further or vote. It looks like you've prepared well for this. 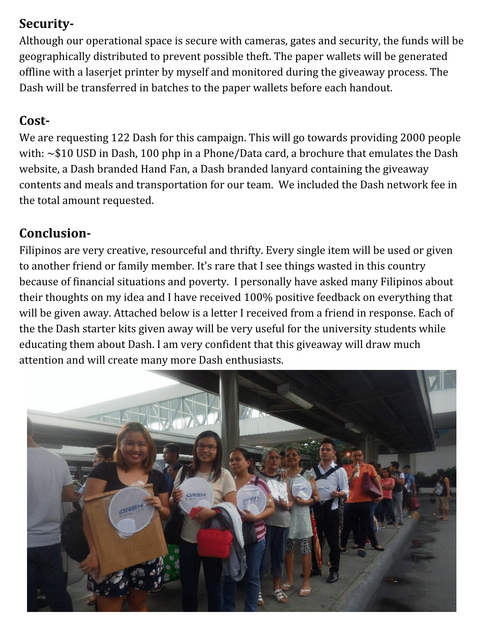 I would be thrilled to see a hundred or more Dash distributed to the people of the Philipines. You've requested enough Dash to give away to 2000 people. Is your plan to simply continue the give aways until you run out of Dash, and then submit a new proposal to do more? It says you will conduct the giveaways at several college locations. Is your plan to only give away on a certain preset calendar of dates, and if you have not given away all the Dash then you have a Dash surplus? Or is your plan to do enough dates and locations until you have run out of Dash? Thank you for your comment, great questions! Yes, our plan is to continue the give away until we run out of Dash, especially in the case of an increased valuation of Dash. Yes, we have many Colleges that we would like to include, on preset dates, in the give away. We will be limiting the number of Starter kits per location based on the amount of kits that can be purchased. If the price of Dash rises we will continue to produce kits and visit new locations. As far as future proposals, we have lots of other ideas but if this is as successful as we hope, we will definitely consider doing future giveaways.